High-rate GPS data from the UNAVCO Plate Boundary Observatory (PBO) network, installed in collaboration with the Alaska Volcano Observatory, were analyzed by a group of geophysicists and volcanologists under the lead of Mario Mattia (Istituto Nazionale di Geofisica e Vulcanologia, Catania, Italy) in order to study in detail the deformation and unrest preceding a major eruption of Mt. 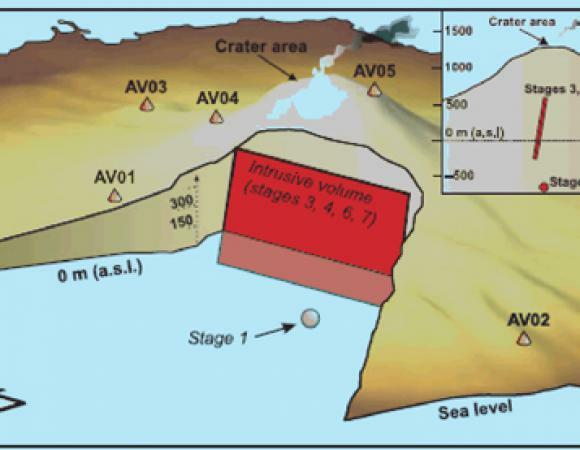 Augustine volcano (Mattia et al., 2008). Augustine volcano is a 1260-m-high dacitic stratovolcano located in lower Cook Inlet, about 280 km south-west of Anchorage, Alaska (Fig. 1). It consists of a central dome and lava flow complex, surrounded by pyroclastic debris. 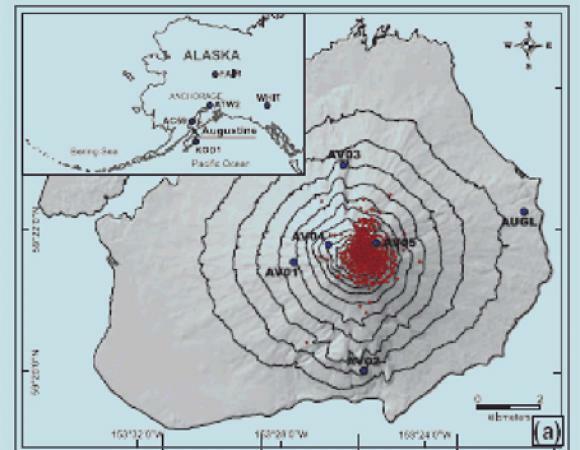 Prior to the 2006 eruption, Augustine volcano had six major historically reported eruptions (1812, 1883, 1935, 1963-64, 1976 and 1986). Historical eruptions typically consisted of explosive activity with emplacement of pumiceous pyroclastic- flow deposits followed by lava dome extrusion with associated block-and-ash flows. 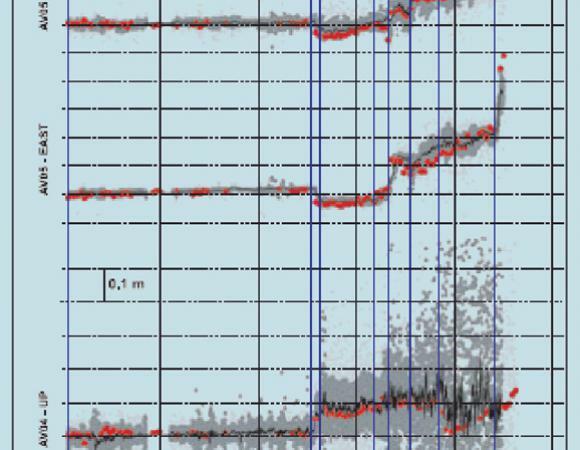 Volcanic eruptions are usually preceded by measurable signals of growing unrest, the most evident of which are the increase in seismicity and ground deformation. It is also important to identify precursors of a possible renewal of the volcanic activity and to distinguish between an eruptive activity characterized by an intrusion (with the related destructive power) and a migration of magma stored in the main conduits. The 2005-2006 eruption at Mt. 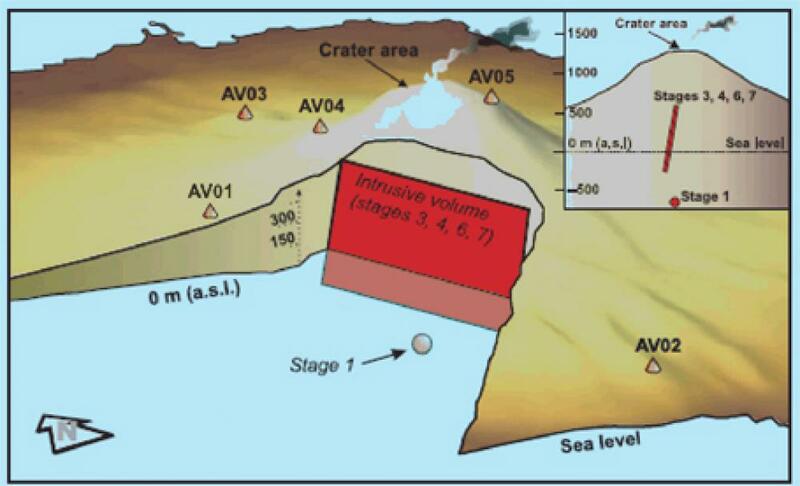 Augustine is a good example of a massive migration of magmatic fluids from depth (about 1 km b.s.l.) under the effect of gas overpressure. The 2006 Augustine volcano eruption was heralded by a steady increase in microearthquakes beneath the volcano in May 2005. Deformation began in early summer 2005 coupled with small gas emission. The movements, recorded by high-rate GPS data (15 s sample data and coordinate solution) from PBO stations deployed on the volcano, define the dimensions and the characteristics of the shallow plumbing system. In this study, Mario Mattia and co-workers propose a model of the different stages preceding the effusive phase (the precursory phase), where gas overpressure in the body of the volcano opens the terminal conduit. Reference: Mattia M, Palano M, Aloisi M, Bruno V, Bock Y (2008) High rate GPS data on active volcanoes: an application to the 2005-2006 Mt. Augustine (Alaska, USA) eruption. Terra Nova 20 (2): 134-140 doi:10.1111/j.1365-3121.2008.00798.x.